You need a quick professional quality print? Just walk in to our store anytime to print your own files from a memory card, memory stick or any other digital media. People have always stored their special images as prints. Even in the digital age, our appreciation for a well printed photo, kept in a special place, holds true. There’s nothing like a print. If we treat them well, they last forever, whether your reasons are sentimental, artistic or simply decorative. Printed photo are safe from a hard disk crash or stolen equipment. However careful people are, bad backup habits and crashed disks are unforgiving when it comes to protecting memories. Besides, there’s the unique pleasure of touching and feeling a good quality print. Prints allow you to place memories of people or events you remember fondly on your desk or in your home. Photo CDM has three do-it-yourself workstations that use state-of-the-art technology. You can make prints up to 4″ x 6″ on the spot. Just rbing in your files on CD, DVD, USB stick, or memory card. Our self-serve option allows you to quietly preview, adjust, crop and print the exact quantity you need. All you need once you’re done is to pay at the counter and walk off with your photos. Not sure? Let us help you! If you’re not quite sure about using our devices on your own, our staff will gladly assist you in selecting, adjusting and printing your photos. Photo CDM uses professional quality photo paper for all printing work. Our papers are archive certified and our processes use inks specially formulated for color stability and conservation. At Photo CDM, we constantly monitor technical improvements in coloring agents and pigments to make sure that oour prints offer accurate colors, correct tonal values, and long term resistance to fading. If you choose to have us do your printing in our digital lab, most jobs left at the counter can usually be picked up the next day. 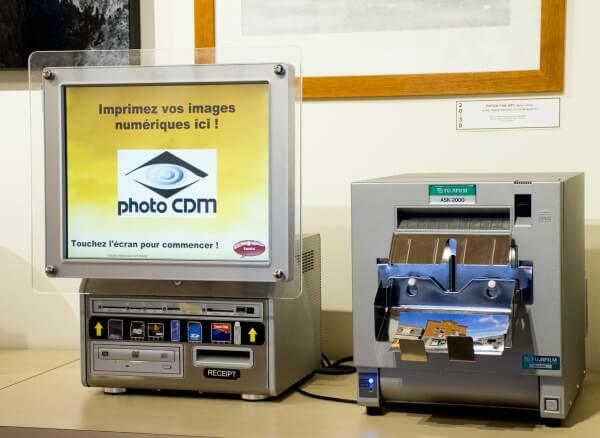 If you prefer, Photo CDM can also send your photos by mail or express courrier.